This past Friday was an exciting day for one Durham man, Mussasa Mpengh. Social entrepreneur and Kenan-Flagler Business School instructor, Jim Kitchen, had a very big surprise in store for Mpengh. “Mussasa, this is your new car, and these guys made it possible,” said Kitchen, as he pointed to the group of students standing by. As the crowd cheered, Mpengh walked up to the gold Honda sedan with a red ribbon on top parked in front of the Wells Fargo on Franklin St. Without the students who volunteer their time with the Community Empowerment Fund (CEF), this would have not been possible. CEF is a student-powered non-profit organization focused on enabling and sustaining transitions out of homelessness and poverty. Christmas came early this year for Mpengh – a refugee from the Congo in central Africa who moved to North Carolina nearly seven months ago. “I fled my country because of the Civil War in South Africa”, said Mpengh. Moving to the United States has been a blessing and a big transition for Mpengh. A welder by trade, he has been unable to work in the welding industry since most of the welding jobs are located in the Research Triangle Park area. The public transportation that he relies on to get to and from work and school does not have a stop that could get him to a job in that area. Mpengh is currently working as a dishwasher at Duke and often has to leave early in order to pick up his kids from school, since he doesn’t have a car. He is enrolled at Durham Tech and is working toward a welding certificate, since his credentials and his experience of over 10 years working in South Africa do not apply here in the U.S.
Mpengh is especially grateful that he will now be able to get to and from his new job, “I got a new job in Raleigh while I live in Durham, so using public transportation every day was a big problem for me. With this car it will help me to seek other opportunities,” said Mpengh. James Park from Crown Honda of Southpoint, joined the celebration on Friday as well. He has been working closely with Kitchen and CEF to get these cars to the folks who deserve them. 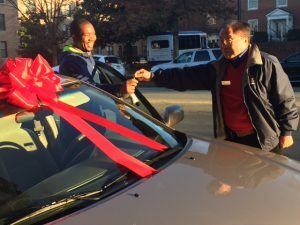 “Crown Honda has been a great partner with giving these cars away,” said Kitchen. There were plenty of smiles and cheers from everyone as Mpengh took off in his new car. What’s next for Mpengh? He hopes to move to Orange County and enroll his children in Chapel Hill – Carrboro City Schools. His next big financial goal is to build his credit so he can buy a home.